LOS ANGELES — The Edmund Pettus Bridge stood center stage in both the performance and acceptance speeches by John Legend and Common for their Oscar-winning song "Glory" from the film "Selma". The site where some 600 civil rights protesters were first attacked by law enforcement as they left Selma, Alabama 50 years ago to march and returned in larger numbers led by Martin Luther King Jr. to journey to Montgomery, Alabama, was visually recreated onstage Sunday with a chorus marching through it. "This bridge was once a landmark of a divided nation but is now a symbol for change," Common said while accepting the award. "This bridge was built on hope, welded with compassion." The award was given to composers Legend and Common under their legal names, John Stephens and Lonnie Lynn. "Nina Simone said it's an artist's duty to reflect the times they live," Legend said, referring to the singer and activist. "Selma is now because the struggle for justice is right now." Legend cited voting rights and the incarceration rates of black men. Backstage, he said there was still a lot to be done. "When you think about equality and freedom and justice, we've got more work to do," he said. 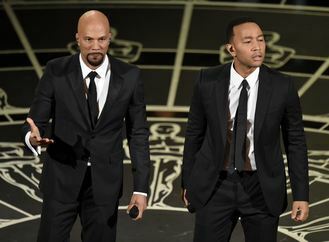 Common, who also had an acting role in the film based on the historic 1965 march, said it was their duty to speak out, given the stage and setting of the Oscars. "How could you not say anything, especially representing a film like 'Selma'," he said. Tears covered the face of actor David Oyelowo who starred in "Selma" as Martin Luther King Jr. and stood with the rest of the crowd for a standing ovation after the pair's performance. Common credited Oyelowo with ensuring "Selma" was made by getting director Ava DuVernay on board and involving Oprah. The singer said he had called up Legend while he was on tour in London inquiring about collaborating. "That word really inspired me," Legend said of "Glory". "The song should sound triumphant."